The idea for a honeybee sanctuary at Green Gulch Farm emerged out of concern for the survival of bees and the health of the global biosphere. The vision of organizers is to develop new approaches to apiculture and the study of the natural life forces and instinctual needs of bees. Initially the health of the bees will be the primary focus of the honeybee sanctuary. The long-term goal is to create a self-sustaining apiary, which links local wild honeybees to a bee-centric approach to apiculture. Inspecting the new log hive on Arbor Day. On Arbor Day (last Sunday) the project started with an evaluation of wild and managed bee hives in the garden, farm and surrounding landscape: four wild hives, and four hives in boxes of various designs. The crew found that the vast majority of them had survived the winter and are now growing with the beginning of early spring. Bees from all eight hives will begin to venture out as swarms in the spring and occupy any empty nest sites/boxes. 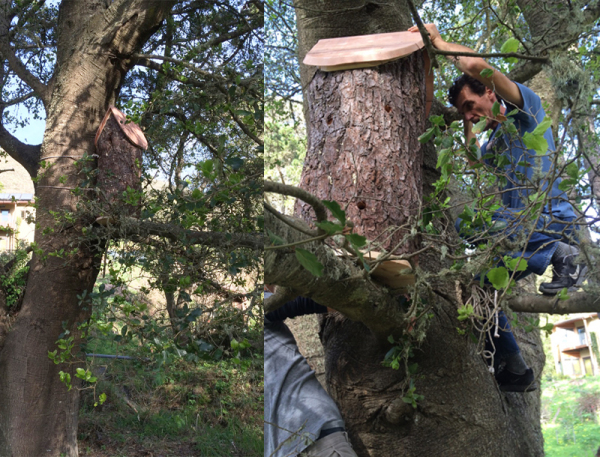 A log hive, a first for Green Gulch, was installed in an oak tree to introduce a natural nest habitat for honeybees. There will be three beekeeping classes at Green Gulch throughout the year, where we will share the core principles of this new approach, paired with biodynamic practices and the study of the physiology and morphology of honeybees. The first comes at the end of this month, which, like the others later, is open for practicing beekeepers as well as for beginners and all �bee-lovers.� The classes will be a resource for backyard beekeepers to keep their bees more healthy and strong. For more information, read about the first class, Biodynamic Apiculture: Supporting the Life of Bees, offered on Saturday, February 28, The Green Gulch Farm Honeybee Sanctuary: A New Framework for Living with Bees, on Saturday, May 30, and Honeybees for Life: Basic Call to Consciousness, on Sunday, October 4, 2015. 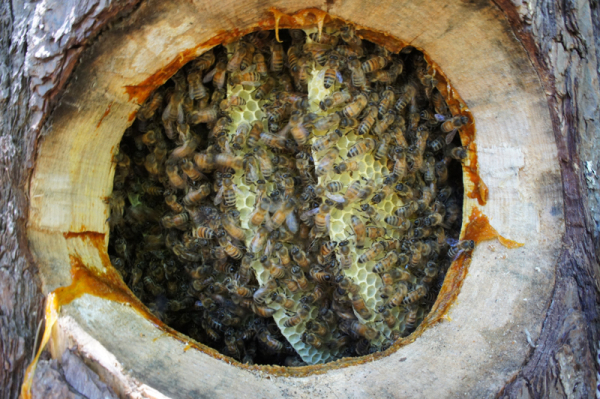 From Michael’s own apiary�an example of what a log hive may look like when active. For more from Michael on this topic, visit gaiabees.com, or read the interview: Bee Well and Be Well: Michael Thiele Discusses the Spiritual Significance of Bees.